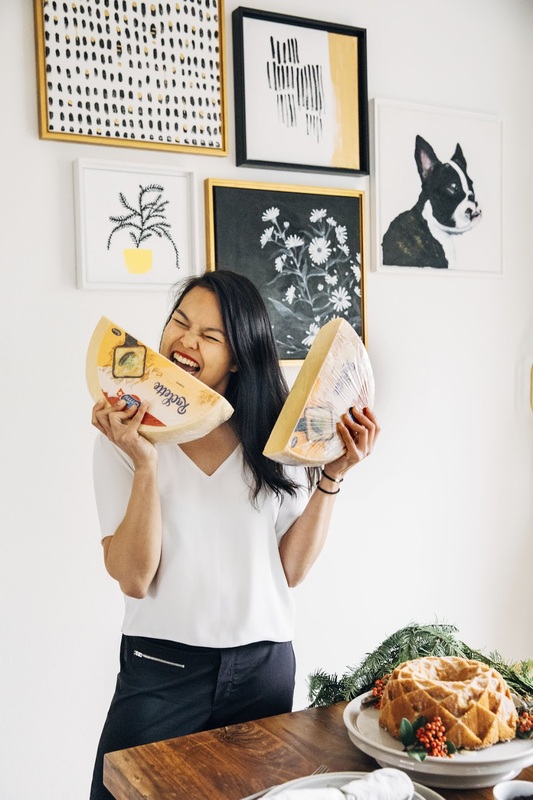 This post was sponsored by Emmi Cheese, the world's largest Swiss milk processor and makers of delicious Swiss cheeses like gruyère, raclette, fondü and more! As always, all thoughts and opinions are my own, and thank you for supporting Hummingbird High and my awesome sponsors! A few years ago, when I was still living in New York, raclette was all the rage. There was a food stand in Bryant Park that specialized in taking half a wheel of the Swiss semi-hard cheese, broiling the sliced half to get it all molten, and scraping gooey and melted bits over prosciutto sandwiches filled with butter and gherkin pickles. Unfortunately, despite how tasty the sandwich looked, I could only admire it from afar — the line was always too long, a testament to raclette's deliciousness. Later, when I moved back to Portland, I attended a dinner party at my friends Jeremy and Sze Wa's house. 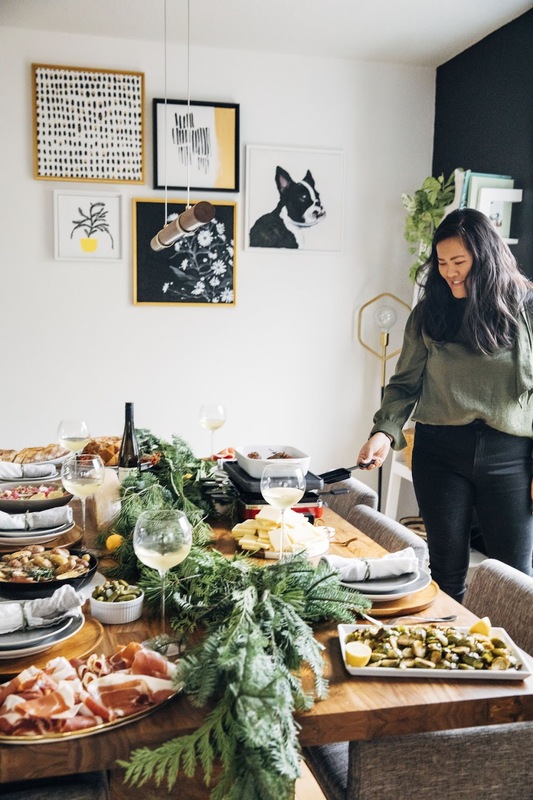 In my friend circle, both Jeremy and Sze Wa were known for hosting large and extremely generous dinner parties — they frequently invited folks over for delicious hot pot parties, crepe making dinners, and dumpling folding lunches. At our last hot pot party, as we were cooking meat, vegetables, and noodles in pots of salty broth, Jeremy suggested that we throw a raclette party for our next dinner. 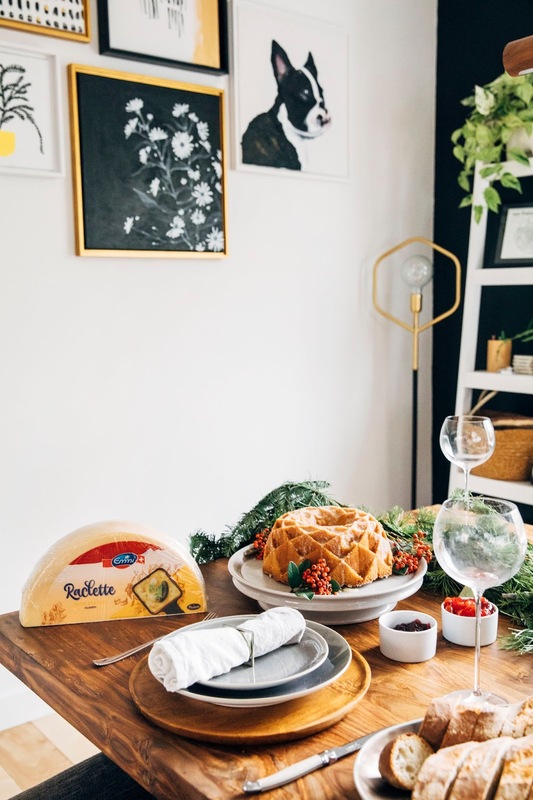 To throw a raclette dinner party, you'll need a half wheel of raclette cheese. We used Emmi Raclette, which had a nice, mild aromatic flavor perfect to pair with a variety of foods (more on that later). Its flavor is really tasty and clean (this is likely due to the fact that Raclette is made with milk from cows that are fed fresh grass in the summer and meadow hay in the winter), and I found myself eating slices of it before it was even melted. Each half wheel is larger than my head (see below), around 5 to 6 pounds, and will feed 6 to 8 hungry people. 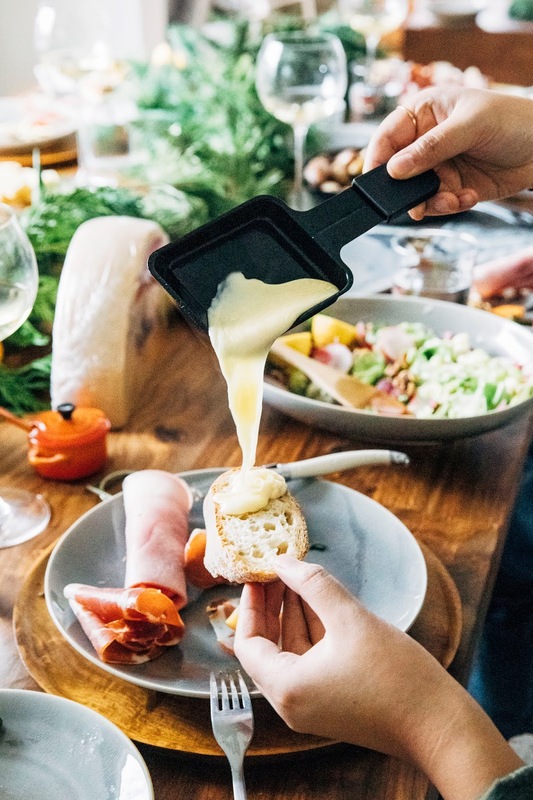 A raclette pan sits at the center of the table for everybody to access. Slices of raclette are placed into small nonstick pans, called coupelles, which are then placed underneath the broiler of the raclette pan. On top of the pan, you can place the food items that you're serving with the raclette to keep them warm. If you don't want to invest in a raclette pan, you can also place slices of raclette in a cast iron pan and broil in the oven until the cheese is molten and gooey. While this works well in a pinch, it's a bit of a bummer for dinner parties as you'll need to go back and forth to the kitchen whenever somebody wants another serving of raclette. 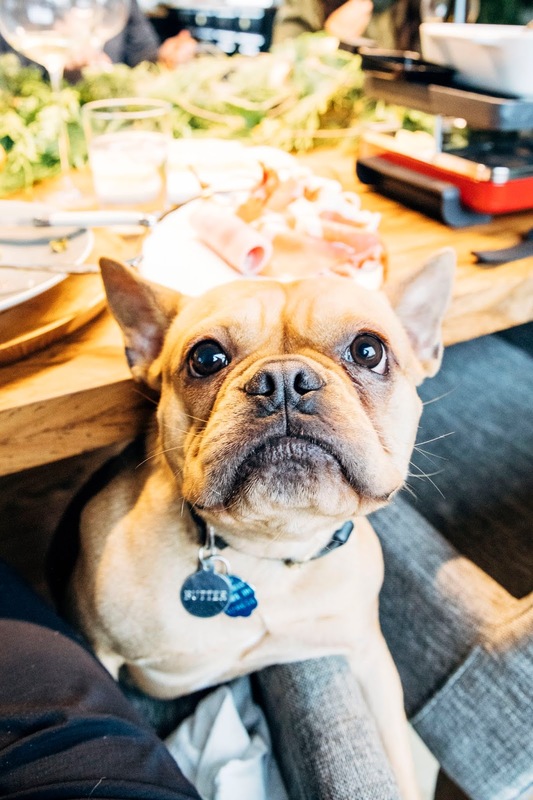 Jeremy and Sze Wa served the raclette with prosciutto, French ham, fingerling potatoes and hasselback sweet potatoes, roasted brussels sprouts, and gherkin pickles (cornichons). 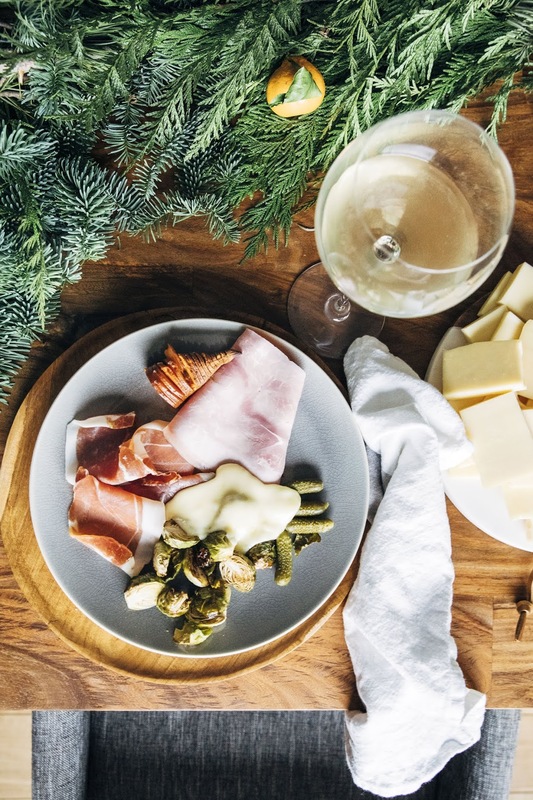 It's important to serve the raclette with something acidic and/or briny (think: pickles and onions, dry white wine or even a tart cider) to refresh the palate and cut down on the richness. Although it's not traditional, I also insisted on serving the raclette with a baguette since I love the combination of melted cheese and bread. 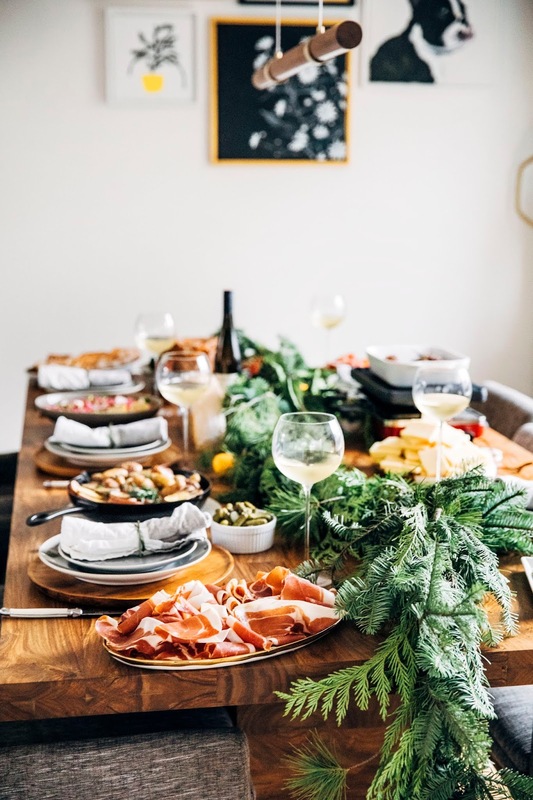 Jeremy made fun of me for doing so, but the beauty of a raclette party is that you can easily customize it and serve the cheese with your favorite meats, vegetables, and even fruit. Raclette is available at the cheese counter in your grocer's deli or your favorite specialty cheese shop. Raclette grills are easily available for purchase online and specialty kitchen stores; Jeremy and Sze Wa used a model very similar to this grill. Erlend and I are thinking of investing in this smaller one for just the two of us (for future date nights!). 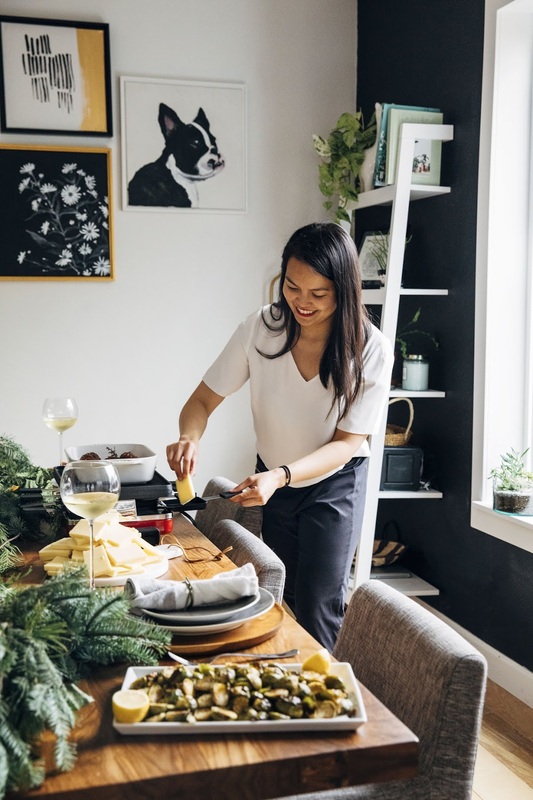 For more raclette party hosting tips, I found this article by The Inspired Home and The Spruce particularly helpful.